So for my book report i chose to read, The Demon-Haunted World by, Carl Sagan. I was walking in Barnes and Noble one day to search for a book to do my report on and the first one i came across was Sagan's. So I sat down and started reading a little bit of the first chapter and was instantly hooked. This book is an arrangement of essays by Sagan and his wife that covers numerous different topics about pseudoscience and regular science. In "The Demon-Haunted World", Sagan distinguishes between the myths of pseudoscience and realities of science. Some of the topics that Sagan cover are the most popular ideas in pseudoscience such as, Aliens, demons, magic, witchcraft, things that can not be explained. His main focus in the book is to get you to ask questions and to be a little skeptical about things you hear in the paper and on the internet. One of the reasons i liked this book was because of how it was different from your average book. I like the fact that each chapter is a different essay written by Sagan. This helped to keep the book interesting and kept me wanting to read more. Another part I found interesting in the book was how so many people did not know that much about science at all. In the book there is a quote by Sagan that really got me thinking. From that quote he goes on to talk about how 95 percent of people are unfamiliar with so many different things about science, myself included in this 95 percent. Just like the man in his first essay i have always been fascinated with the unknown and all of the cool ideas such as Atlantis, Aliens, and the supernatural. This books goes in-depth on some of the most unknown ideas and myths that are brought about by pseudoscience. However it also shines a light on some of the myths to where real scientific beliefs can explain some of the things that are not real. I found this book really interesting and would definitely encourage someone that really has a "passion for science" to read it. 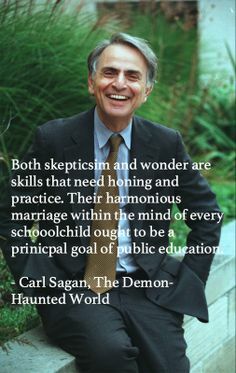 Below is Sagan's last interview and in it he talks about his latest book "The Demon-Haunted World: Science as a Candle in the Dark" and it basically sums up his beliefs and why he wrote the book.